Roland have newly announced the Roland FA07. The music workstation keyboard with ultra-intuitive workflow is now available in 76-key format. The new Roland FA-07 Music Workstation joins the FA-06 and FA-08 to the seminal Music Workstation family. The entire FA Music Workstation series of keyboards received a major update with the release of Version 2.0 software. And, all new FA keyboards now come with a free version of Ableton’s Live 9 Lite music production software for Mac and PC. 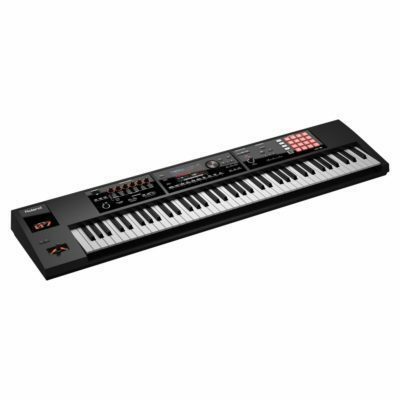 The Roland FA-07 features a 76-note, velocity-sensitive keyboard with semi-weighted action. Like all the FA Music Workstation keyboards, it includes 2,000+ sounds, wave sound expansion slots, Roland amazing SuperNATURAL synth engine; a 16-track sequencer; 16 pads; extensive onboard effects; groove sampling; DAW control; USB connectivity; advanced performance control options including D-Beam, Rhythm Pattern, Chord Memory, and Arpeggiator; audio export of sequences to SDHC cards; guitar/mic and line-in jacks; dedicated input reverb; MIDI communication with iPad; and many more! An integrated sequencer offers simple operation and non-stop loop recording, and you can easily export tracks for further development with your DAW. In addition, the Version 2.0 system software update for the FA Music Workstation series includes new functionality requested by FA users. The new Tone Remain function allows users to switch sounds seamlessly, with no notes or effect tails being unnaturally cut off. Another new enhancement is master control functionality, which has now been added to studio sets. This enables users to assign and send out a variety of MIDI messages, letting them reconfigure the FA and multiple external devices with one command. Version 2.0 is included in all new Roland FA instruments, and is also available as a user-installable update for current owners. The new Roland FA-07 will be available in July 2017.